I think the Wire ruined every cop show for me for the rest of my life. If something better comes along, I'll be very happy though. 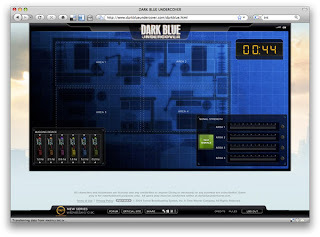 I don't think Deep Blue fits that category, but I'm only judging it by it's previews, I could be wrong. 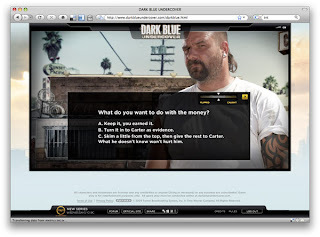 I like the Deep Blue promotional site however. 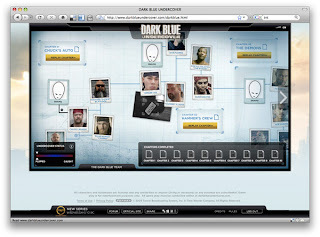 The site is an interactive experience where you join the Deep Blue team and go undercover. What you see above are the organizations I have infilitrated so far. A new chapter comes out every week, and you can sign up to win an "Undercover" trip for two to LA. 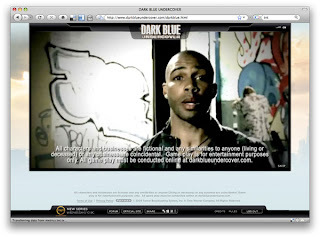 Video clips of the show's characters briefing you on the jobs you need to do. Interactive conversations with the bad guys. If you look at the upper right corner of the text box there's a litte spectrum device. This determines whether or not you are close to being caught, or being "flipped". Which leads me to believe there might be multiple endings to this. And there are multiple games for each chapter. The games are simple but fit very well in to the story-line. Like hot-wiring a car, or, as seen above, wire-tapping a house. Overall it's a little cheesy, but I'm a sucker for episodic interactive.